Hooked on Needles: Crocheted Hexagon Granny Afghan ~ Finished! 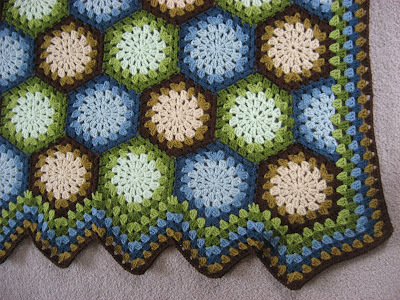 Back in June, not even two whole months ago, I showed pictures of the yarn I purchased for this crocheted hexagon granny afghan on THIS post. 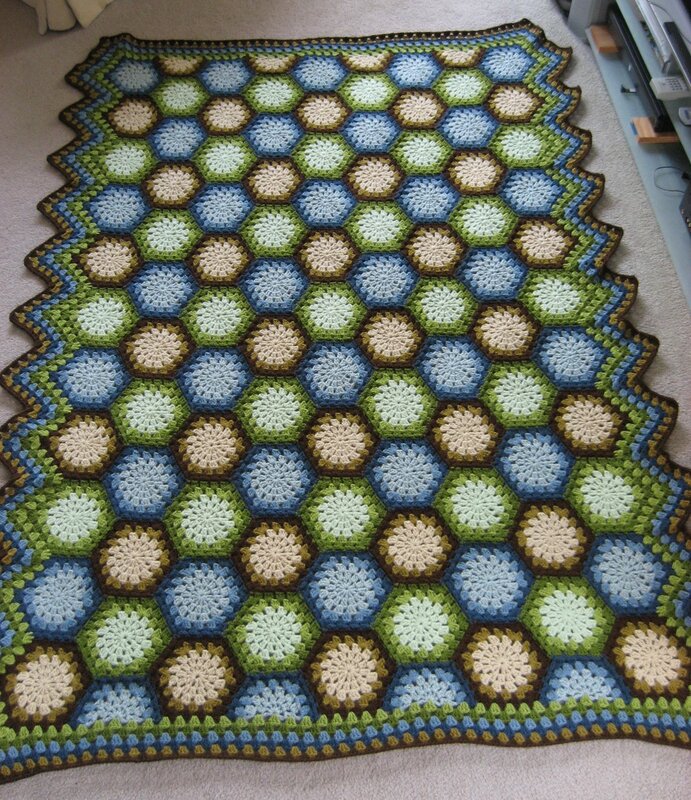 And now here we are, less than two months later, with pictures of the completed afghan! Wow! This one worked up so quickly and was so fun to crochet. I learned a few things in the process too. One thing I learned was that Bernat Waverly yarn is really wonderful to work with. It has the structure I like in Red Heart Worsted, but it is so much softer and more comfortable. 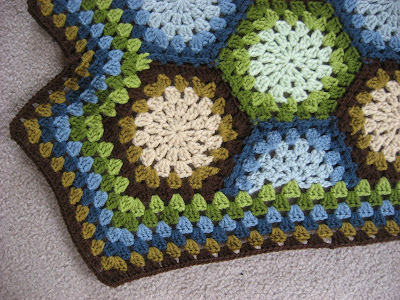 I also learned that the join-as-you-go method of connecting granny blocks is absolutely the way to go! 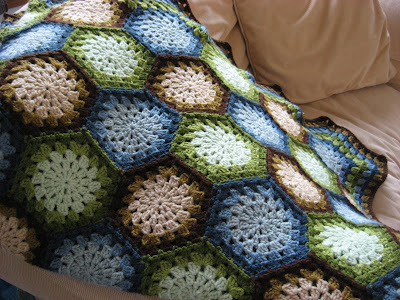 I don't think I'll ever join blocks with whip stitch or single crochet again! Never say never though! So I'll just say I really love this method of joining blocks and will probably use it from now on! The finished measurements ended up being about 68 by 52 inches. The border on this afghan has the zig zag design on the two long sides instead of straight edges like Lisa made in her original afghan, which you can see over at Polka Dot Cottage where I got this pattern. 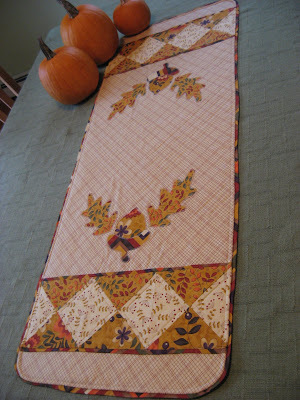 Another difference between mine and Lisa's is the color choice for the border rows. 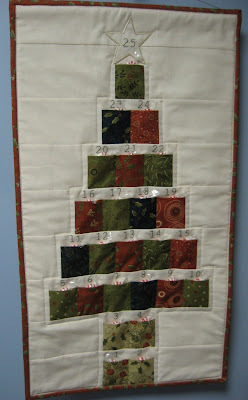 Since I only used three shades of each color, I decided to use the medium and dark shades of each color in the border for a six-round border, whereas Lisa used several shades of just green for her border. 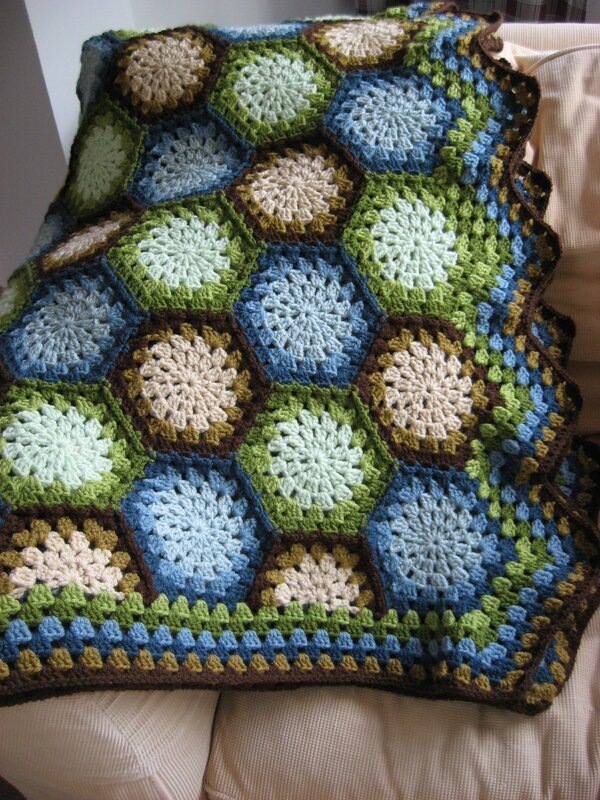 So there it is, my crocheted hexagon granny afghan, complete and ready to mail to the newlyweds. I'm already dreaming of color schemes for other hexagon granny afghans since this one was so fun! But my next crochet project has already been started and it is the other wedding gift afghan for another niece who is getting married in a few weeks. 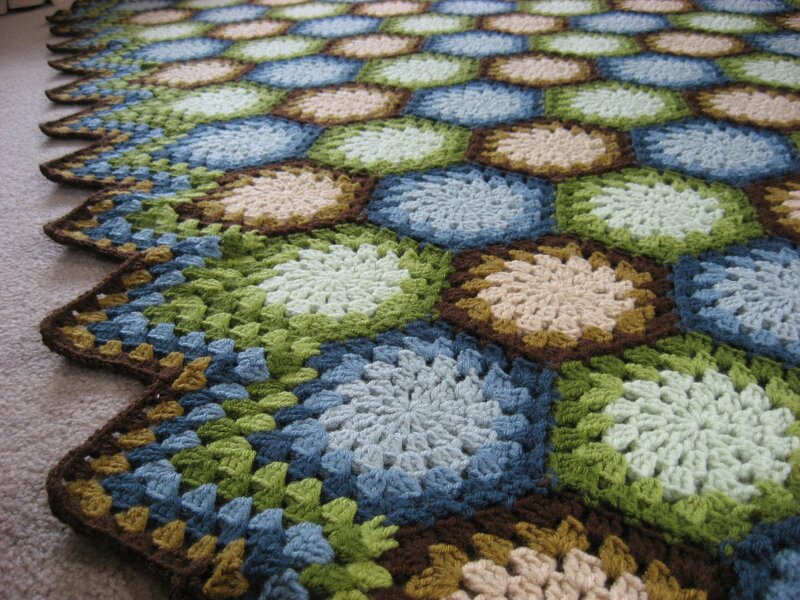 This next one is all one piece, crocheted back and forth in rows, and all one color, so it will be a very different project from the hexagon granny. I'll share pictures of that one soon. Absolutely beautiful!! Love the edging you chose to use. Just beautiful Mary Grace. 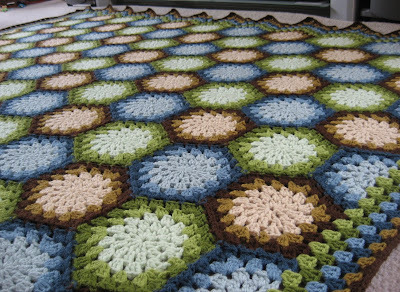 I love your yarn choices! It is so cool to see it all finished, and I love to see how you changed it up. I hope your niece loves it! Thank you for linking back to my tutorial every step of the way, as well - I appreciate that!